We’d love your help. 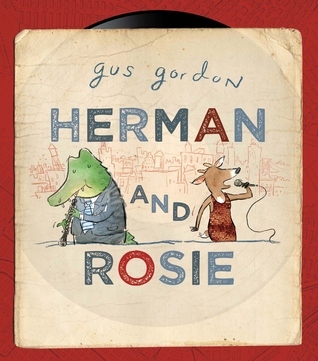 Let us know what’s wrong with this preview of Herman and Rosie by Gus Gordon. 'Quirky, soulful an Set in New York, this gorgeous picture book by Gus Gordon is a story about friendship, life in the big city, and following your dreams. To ask other readers questions about Herman and Rosie, please sign up. A wonderful picturebook about loneliness and music and Magic in Manhattan. Herman lives on the seventh floor of one apartment building and Rosie, who lives on the fifth floor of an adjoining apartment building. I had read recently on someone's recommendation a book Gordon illustrated, The Catawumpus Cat, which I liked a lot, for a variety of reasons, among them the illustration style. Gordon liked my review (this is always surprising to me when this happens, and it happens so rarely! ), so I made A wonderful picturebook about loneliness and music and Magic in Manhattan. Herman lives on the seventh floor of one apartment building and Rosie, who lives on the fifth floor of an adjoining apartment building. I had read recently on someone's recommendation a book Gordon illustrated, The Catawumpus Cat, which I liked a lot, for a variety of reasons, among them the illustration style. Gordon liked my review (this is always surprising to me when this happens, and it happens so rarely! ), so I made a special effort to look for other work he did and found this book, which I liked even more than the previous book (does this sound like pandering?! Look at the Goodreads rating for the book! I am serious, I loved it!). Gordon's illustration style is groovy, funky, sweet, fitting the story perfectly where two lonely New Yorkers fall in love with the groovy sound of each other's music wafting out of their apartment windows. Herman plays oboe, Rosie sings. So the eternal question is: How can these two nice people who love music meet in a city where millions live next to each other and are still often desperately lonely? And what might they have in common, besides music? (One answer: films about oceans, such as Jacques Cousteau documentaries). New Yorkers are singularly single minded. It’s not enough that our city be rich, popular, and famous. We apparently are so neurotic that we need to see it EVERYWHERE. In movies, on television, and, of course, in books. Children’s books, however, get a bit of a pass in this regard. It doesn’t matter where you grow up, most kids get a bit of a thrill when they see their home city mentioned in a work of literature. Here in NYC, teachers go out of their way to find books about the city to read and s New Yorkers are singularly single minded. It’s not enough that our city be rich, popular, and famous. We apparently are so neurotic that we need to see it EVERYWHERE. In movies, on television, and, of course, in books. Children’s books, however, get a bit of a pass in this regard. It doesn’t matter where you grow up, most kids get a bit of a thrill when they see their home city mentioned in a work of literature. Here in NYC, teachers go out of their way to find books about the city to read and study with their students. As a result of this, in my capacity as a children’s librarian I make a habit of keeping an eye peeled for any and all New York City related books for the kiddos. And as luck would have it, in the year 2013 I saw a plethora of Manhattan-based titles. Some were great. Some were jaw-droppingly awful. But one stood apart from the pack. Written by an Aussie, Herman and Rosie, author Gus Gordon has created the first picture book I’ve ever seen to successfully put its finger on the simultaneous beauty and soul-gutting loneliness of big city life. The fact that it just happens to be a fun story about an oboe-tooting croc and deer chanteuse is just icing on the cake. Personal response: What a cute story! I was not expecting much from this book and I am not sure why, however, I ended up loving it. The story has two elements that really drew me in. First off, the theme of being in place full of people, but still feeling lonely. It is easy to feel that way at a big university. Secondly, the theme of friendship. Rosie and Herman just understood each other. 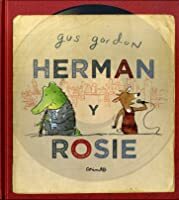 I am lucky to have friends who understand me and Rosie and Herman understand each other and this book makes Personal response: What a cute story! I was not expecting much from this book and I am not sure why, however, I ended up loving it. The story has two elements that really drew me in. First off, the theme of being in place full of people, but still feeling lonely. It is easy to feel that way at a big university. Secondly, the theme of friendship. Rosie and Herman just understood each other. I am lucky to have friends who understand me and Rosie and Herman understand each other and this book makes me more grateful for them. -Kids will like this book because it talks about things that are very real to them: loneliness and friendships. -This book is a good way of integrating music into the classroom since Herman plays the oboe and Rosie is a singer. Children may not know what an oboe sounds like and this could provide a good opportunity to pull up a video of someone playing the oboe, which would enrich their lives musically. -You could also talk about the power of music and how it can bring joy to your life. -I think this book would be a perfect level for a 1st grade read aloud. -This book would be a good example to use to talk about setting since the setting of the city so clearly effects the characters' emotions. This story is quite sad when you realise it's about two music loving animals who are both lonely in New York when dramatically both their lives go into a downward spiral. It then tracks them through their single adventures around New York City and their paths cross but not quite until one magical night when Herman decides to play his Oboe. I simply love the illustrations in the book and could look over the detail for longer than needed. I could even see myself owning a copy of this book one day. I just discovered this book in the library and was so pleasantly surprised with the fun use of mixed media illustrations and how Gus captures such a relatable a real life situation with really cute characters! My new fav author/illustrator I can't wait to read more of his books. I absolutely loved this book and made several book reading noises while reading it in my quiet library. This book has beautiful mixed media illustrations about Herman and Rosie who live in New York. While both characters live in the same city and on the same street, it appears they don't know each other. Early on in the story you find out what drives both Herman and Rosie and realize they have many similarities. Both characters deal with stress and loneliness in similar ways and eventually find I absolutely loved this book and made several book reading noises while reading it in my quiet library. This book has beautiful mixed media illustrations about Herman and Rosie who live in New York. While both characters live in the same city and on the same street, it appears they don't know each other. Early on in the story you find out what drives both Herman and Rosie and realize they have many similarities. Both characters deal with stress and loneliness in similar ways and eventually find friendship through their love of music. This book was a very good book to read because it talks about how two very similar people get together and how they needed each other all along. It teaches children that even though there are a lot of different people out their, there is that one person in this world who you need and how similar they are to you. Sometimes you have to look closely for the things you want and I think that is one of the important messages throughout this book. Herman, a kind hearted crocodile who plays oboe, and Rosie, a tender hearted dear who loves to sing, live within just a few blocks of each other but never have met. They have very similar likes and dislikes but are somewhat thwarted in life until their love of music merges and allows their talents to blossom. My favorite new children's book. It speaks of hope right around the corner, no matter how things may look. Clever story with really unique illustrations. This book is displayed in a place of honor on our bookshelf. The story follows titular characters: Herman, a crocodile salary-man who love Books have always had a storied history with an ongoing playlist of love songs to iconic settings (Real, imagined, and all in-between) and picture books are no different. Herman is a crocodile who lives in New York and finds it very lonely. He loves playing his oboe in his apartment. His job selling things on the telephone, makes his life less lonely because he can talk to people, but doesn’t make him very good at his job. Rosie lives in the building next door to Herman and she loves to sing. She has a job washing dishes but loves most of all her singing lessons and performing in a little jazz club on Thursday nights. The two are lonely but fairly happy because b Herman is a crocodile who lives in New York and finds it very lonely. He loves playing his oboe in his apartment. His job selling things on the telephone, makes his life less lonely because he can talk to people, but doesn’t make him very good at his job. Rosie lives in the building next door to Herman and she loves to sing. She has a job washing dishes but loves most of all her singing lessons and performing in a little jazz club on Thursday nights. The two are lonely but fairly happy because both of them hear great music floating into their windows from time to time. Then one day Herman loses his job and Rosie discovers that the jazz club is closing. The two of them head home and don’t make any music for a long time. Until they wake up one morning and things have changed. They are craving their favorite food and want to make music. Gordon has written a picture book ode to big city living, particularly New York. He incorporates the potential loneliness of urban life but also praises the bustling, the music, the lifestyle. The characters are quirky and believable. They are the sort of characters who make perfect sense, whose actions are credible, reactions ring true, and they make the entire book work. Gordon writes and illustrates with a playful tone. His illustrations are done in mixed media, including photographs, paint, and pencil. The different media are worked together so thoroughly that at times you never notice the photos mixed in. They are so cleverly done that it all forms one unified piece until something catches your eye. Two musical souls in one big lonely city where they live next door to one another. It’s a combination just as exquisite as New York itself. Appropriate for ages 4-6. Brimming with heart and soul Herman and Rosie is a picture book to lose yourself in. Not bad for a book where the main characters don't meet till the closing sequence. Herman and Rosie are New Yorkers. They have much in common, but it's only the reader who is privy to their shared loves: their passions for jazz music and Jacques Cousteau movies. It's the reader who sees their parallel lives and whose heart skips a beat at their near misses. Herman and Rosie are oblivious. 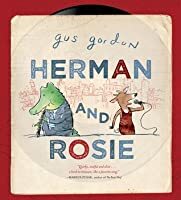 So, this pair like the Brimming with heart and soul Herman and Rosie is a picture book to lose yourself in. Not bad for a book where the main characters don't meet till the closing sequence. Herman and Rosie are New Yorkers. They have much in common, but it's only the reader who is privy to their shared loves: their passions for jazz music and Jacques Cousteau movies. It's the reader who sees their parallel lives and whose heart skips a beat at their near misses. Herman and Rosie are oblivious. So, this pair like the buzz of the city but it can be a lonely place and when they eventually meet, it's pretty special. As the image of them together is the only close-up in the book, it's like we meet them for the first time too. This book is superb graphically. What person born in the era of vinyl records wouldn't love the cover? Cover included, every part of this book is telling the story of Herman and Rosie, from the mapped endpapers, to the Mark Twain quote quietly tucked away through all the intricate multi-media artwork. I've read this many times now and find new details every time. Trees, for instance, that recall Ella Fitzgerald lyrics. 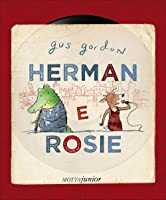 . .
Herman and Rosie is a book to savour, possibly more for adults than kids, though clearly I am not the only admirer, as I saw this book has reached the pinnacle of monthly book club sent into Australian schools. Lets hope such fame helps Herman and Rosie win more hearts. Personal response- As a hopeless romantic, this was such a sweet book. While it is a love story, the book has such a good story behind it. Herman and Rosie both feel alone in this big world. Sometimes I feel the same way while going from day to day. Herman and Rosie play instruments and sing, both things I used to do in high school. This is a such a positive and uplifting book! This is one I want to keep reading for years to come! -Students could relate to the sto Personal response- As a hopeless romantic, this was such a sweet book. While it is a love story, the book has such a good story behind it. Herman and Rosie both feel alone in this big world. Sometimes I feel the same way while going from day to day. Herman and Rosie play instruments and sing, both things I used to do in high school. This is a such a positive and uplifting book! This is one I want to keep reading for years to come! -vocabulary: this would be a story for students who are in the younger grades. After about first grade, this book would not be challenging enough. Younger students might find this book humorous. There is a good amount of complex and simple sentences. There is good figurative language, and the book is very descriptive to where students could imagine experiencing what the book is saying. -strong literary elements- clear setting and clear plot. This book is good for retelling practices and would be good to help students understand character elements. Herman Schubert and Rosie Bloom live in a very busy city in two very small apartments. Herman plays the oboe and likes watching films about the ocean. Rosie likes to sing and watch films about the ocean. They both like living in the big city, but sometimes it can be a lonely place to be by themselves. Although Herman occasionally plays oboe and Rosie hears it, and sometimes Rosie sings and Herman hears it, they never meet. One day Rosie is told that she can’t sing in the club anymore and Herman loses his job. Both are sad and stop playing music. However, when they finally meet for the first time, the city is never quite the same again. My Review: This book is a love note to music and for finding a friend to share your love. This wonderful story is told in a way that makes you fall in love with the characters immediately and feel every up and down with them. Also, the illustrations in this picture book are probably some of my favorite ever. I love the cartoony style mixed with some mixed media. Beautiful. This book kind of sneaked up on me. I was captivated by the map on the end pages with the arrow pointing to the hot dog stand, and the illustrations are great, but I wasn't so sure about the slow to get started story. But like a lot of great books, the story has to have time to build. By the end, I fell in love with both Herman and Rosie. Kids will enjoy the illustrations that really invite them to pore over the pages. It would be great to use this for a unit on mapping or cities too. Honestly, This book kind of sneaked up on me. I was captivated by the map on the end pages with the arrow pointing to the hot dog stand, and the illustrations are great, but I wasn't so sure about the slow to get started story. But like a lot of great books, the story has to have time to build. By the end, I fell in love with both Herman and Rosie. Kids will enjoy the illustrations that really invite them to pore over the pages. This picture book is a true gift of writing and art combined. The story might appeal to adults more than kids though. Herman, an alligator, and Rosie, a deer, both live in NY. The are lonely solitary people in a city of millions. It's a story of near misses. It's a story of pursuing your dreams. I loved it so much I bought a copy just for me. Even if it doesn't appeal to my class, it appeals to me. Herman and Rosie live close to one another in New York City and despite having shared interests haven't met yet, even though they can often be found in the same places throughout the city. A lonely sort of story, this book makes you root for the characters to both find happiness and each other and the ending doesn't disappoint. Mixed media artwork gives the story a scrapbook feel and reads like a love letter to the city the two characters share. Must see for PreK-2+. Never mind that Herman and Rosie live a short stroll away from the apartment we used to live in... my (admittedly sweet and gentle) 4-year-old boy wants this book every night at the moment. Gorgeous illustrations (my boy is particularly enamoured of the map of New York showing the parallel paths taken by Herman and Rosie) and charming story. Herman and Rosie are a perfect match for each other.They both love living in the big city, but sometimes they each find it a bit lonely. This story follows them on their daily routines and the journey they take before finding each other. This is a delightful read and I'm sure children between the ages of five and eight will adore it as much as I did. This might be the best love story I ever read. Because they both lived in the city and they both knew they were out there, and they even ALMOST met, but didn't. So they just had to meet. And they did. And now I bet they can even have a baby. Even if Herman IS an alligator and Rosie's a deer. Stranger things have happened! I officially love everything about this sweet book. Though it's life in the big city and message about following your passions might be appreciated more by adults, the story is very charming and the collage art is fabulous and full of whimsy. What an adorable, sweet story about Herman and Rosie, a crocodile and a deer living in New York whose lonely paths continually *almost* cross until exactly the right time. It captures the feel of New York and each page can be enjoyed at length, so much to see. Loved it! 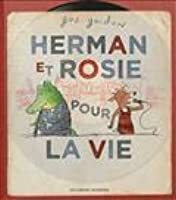 If you are having a blah, winter blues kind of day....then may I suggest you read Herman and Rosie?! It is such a sweet tale of two talented but lonely characters finding one another. Just what I needed. It will make you feel less lonely and more loved. There need to be more picture books like this one. The illustrations and story are as perfect for each other as Herman and Rosie. The story keeps us in suspense wondering if they will ever meet each other and tugs at our hearts with their disappointments and joys. Absolutely lovely. What a charming little tale this is. I'm not sure it plays as well with the under-3 set as it does with this parent, but its a nicely told little love story that doesn't go anywhere a toddler cannot follow. I found it sweet and kind of touching. Gus Gordon is an internationally acclaimed illustrator and author. He has illustrated and written over 80 books for children. His illustrations are known for their loose and energetic line work, mixed media and humour. His writing is always anthropomorphic – where animals take the place of humans in the narrative. He attributes this to his love of Kenneth Grahame's Wind in The Willows. His picture Gus Gordon is an internationally acclaimed illustrator and author. He has illustrated and written over 80 books for children. His illustrations are known for their loose and energetic line work, mixed media and humour. His writing is always anthropomorphic – where animals take the place of humans in the narrative. He attributes this to his love of Kenneth Grahame's Wind in The Willows. His picture book 'Herman and Rosie' (Penguin), a musical love story set in New York, was sold at auction in New York to US publisher Neal Porter Books (Macmillan) and has since been sold into twelve countries. It has been adapted for the stage by several theatre companies, was chosen as the ‘Read for Australia’ book and won the 2013 CBCA 'Honour Award' for best picture book. It has also been shortlisted for the German Youth Literature Award, the Sakura Medal in Japan, the Kirico book awards in Spain, the Les Incorruptibles prize in France and the Premio Anderson Children's Book awards in Italy. In 2016 Gus was nominated for the prestigious 2017 Astrid Lindgren Memorial Award (ALMA). It is the world's largest award for children's and young adult literature. Gus’s latest picture book 'Somewhere Else' was recently published by Penguin Australia and is soon be released in the US with Neal Porter Books. Gus is represented by Charlie Olsen of Inkwell Management.